VW's Chattanooga plant is churning out preproduction batches of a new sedan, which goes on sale in the U.S. early next year. 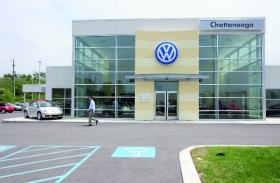 Tom Loafman, U.S. purchasing director for Volkswagen Group of America, had a clear mandate for VW's new Chattanooga, Tennessee, assembly plant: help hold the starting price for the plant's first vehicle to $20,000-plus so that it can compete with the Toyota Camry and Honda Accord. The plant has begun churning out preproduction batches of what VW so far calls its New Mid-Sized Sedan, which goes on sale in the United States early next year. Loafman discussed the plant's purchases and purchasing policies in a telephone interview with Automotive News Production Line Editor David Sedgwick and Staff Reporter Amy Wilson. How many of your suppliers are located in the southern United States? The supply base in the South has been growing. We really had no problem identifying [suppliers] close to the plant. In terms of establishing a supplier base here in the Southeast, it really didn't require us to move a supplier from point A to point B. There was one company we wanted to move close to our operation and that was Gestamp Corp. They built a new facility and moved in machinery and equipment. They are one of several stampers we were able to collect in Alabama, Kentucky and Tennessee. Are all of your suppliers located within a one-day drive of Chattanooga? Not all of our suppliers are within a one-day drive. A portion of our components will come from the Jetta program in Mexico. Can you give us examples of Mexican components shipped to Chattanooga? There are some stamped components for the chassis and body structure. There will be some carryover parts [from the Jetta]. The New Mid-sized Sedan was designed to let you borrow parts from the Jetta, right? That was the plan right from the start. The two models share 30 to 40 percent of their components. So you hit your target for using carryover parts? Absolutely. Vehicle programs always put out a target for carryover parts, and it's a very tough task to hit that target. But it was amazing how well our engineering was able to hold to the carryover target. The New Mid-Sized Sedan will be produced and sold in North America and China. Do you consider it to be a global car? It would be inaccurate to call it a world vehicle. It really represents only those two regions. It won't be exported. Are you bringing in any parts from China? I think a very small portion will come from Asia. Some parts are coming from Mexico, and a very small portion of parts is coming from Europe. What components are you importing from Europe? The majority are the smaller components, low-value items. It's a very small portion of the vehicle. You're looking at simple small brackets, screws, nuts, bolts, clips. You're not importing any Europe-built engines? We haven't released any of that information. What percentage of parts for the New Mid-Sized Sedan will be produced in North America? In the end, we were able to achieve a globalization rate greater than 85 percent. Clearly, we've overachieved our localization target. Did your suppliers have to add capacity, or did they merely retool their unused production space? It has been a mix. With some suppliers, like Gestamp, they added capacity and brought in new equipment. But for the most part, suppliers are using existing buildings. You might see more capacity -- more machinery and equipment -- and definitely you are seeing employment pick up. Does the euro's decline have an effect on your sourcing decisions? Can you import European parts that previously would have been too costly? No. Right from the beginning, we decided that this vehicle was going to be produced and sold in North America. We were not going to depend on the fluctuations of the euro one way or the other. We want to do business in dollars. Will all your steel come from North America? That is being worked out right now. For steel and polymers, if we purchase the components locally, we also try to purchase the raw materials locally. We do this so that our suppliers won't be caught in exchange-rate fluctuations.